Perhaps the most noticeable attendees at the first “event” were the shiny Apple kit that was present. The complete suite from Mac Book Pro, through iPad to iPhone were present and correct, and working effortlessly off the eduroam-enabled WiFi network in the Grad Centre. Oh! How I love eduroam! What a joy it is to just walk into a WiFi-enabled room, open my laptop (yes I was the one with the MBP) and connect to the network without doing anything. That’s the way wireless networking should be! The coffee might not have been great (but then I did have the first of the morning – barely waiting for the device to warm up), but the chat and banter was great. I tried to keep a twitter flow running so that those who had indicated that they couldn’t make it would get a feeling for what was going on. There was quite a focus on social media and “new journalism”. This was not surprising, given Glyn Mottershead was an early arrival. 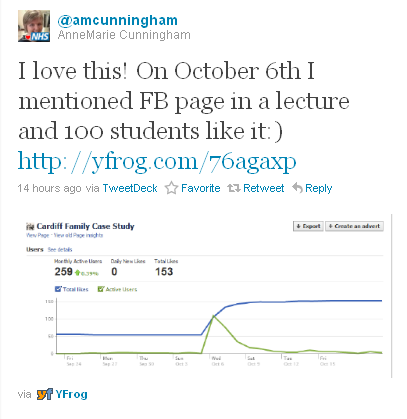 We did have tweets into the event from Anne-Marie Cunningham who shared with me her excitement of 100 hits on a Facebook page from her new first year students without her having referenced it at all. Then we also had a tweet in from Sarah Nicholas bemoaning the fact that she had been on leave and hadn’t dragged herself in so that she could have chatted about her Connected Researcher Workshop session planned for the New Year. I’ve been playing around with Yammer again. It’s an interesting tool as you can have “inside the firewall” [corporate-centric] discussions, groups [for tasks/projects and focussed discussion] and communities (which is what I’ve set thoughtgrazing up as) for [discussion that can include external “partners”]. It appears to me to be an ideal “half-way house”, or at least one that allows the social media seed to be sown. I feel much the same about posterous – I may actually use posterous too for “Thought grazing …” as you can post to it using tools that most users are happy with … ie email. Other than Anne-Marie and Sarah a few other apologies were received – Kelly Page, Mike Johnston, Andrew Frayling, Martin Weller and Stuart Hill – but the rest of us – Joe Nicholls, Paul Hobson, Chris Graves, Simon Wood and Cathie Jackson and me had plenty to talk about. Of the topics that I picked-up on (I was being acused of being anti-social for trying to tweet/yammer at the same time) I thought one which centred around how we might improve the IM Chat service using XMPP (Jabber) was very interesting. There was animated discussion on aggregators for the iPad with GoodReader getting the vote ahead of instapaper. Of course if you’re looking for x-platform feedly or tumblr (for RSS feeds) and paper.li (twitter as a newspaper) might be of interest. There was also some discussion about the day of the week that we might try and use for the next event.